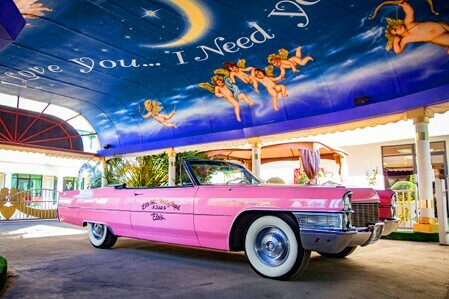 Maybe our famous Pink Cadillac or Elvis wedding? You can choose between our five beautifully decorated indoor chapels (the Little White, L’Amour, Crystal, Promises & Green Room), our outdoor gazebo, or our historic world-famous Tunnel of Love Drive Thru. We also offer high-definition streaming of your service for a small fee. With this option, family and friends can view your ceremony online, live or on-demand, in the comfort of their own living rooms. Our **courtesy stretch limousines are waiting to pick you up within five miles of the chapel, upon availability and not included in all of our services. You will be driven to one of our unique chapels ranging from a quiet and cozy atmosphere to an elegant beautiful Victorian setting. Following your ceremony, the limousine will return you back to your hotel. At the Little White Wedding Chapel, we provide various wedding and ceremony packages to suit your budget and your preferences. 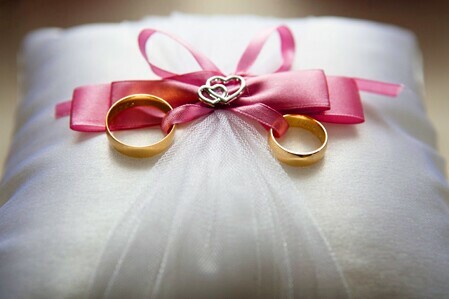 Opt for a traditional romantic wedding with the Lover’s Package or renew your vows with the Honeymooner’s Package. Consider an exciting Las Vegas twist on a traditional wedding with our Elvis and Pink Cadillac Packages. Upon entering A Little White Wedding Chapel, you will be convinced your special day will be beautiful. You will feel the romantic atmosphere surround you, enhanced with traditional wedding music and the fragrance of fresh flowers. It will be the ceremony you’ve always dreamed of having. Feel free to give us a call or contact us anytime between 8:00 AM and 12 Midnight (PST) for more information on getting married in Vegas. Come join our many happy couples. At the Little White Wedding Chapel, we know that no love is the same and no wedding should be the same either. 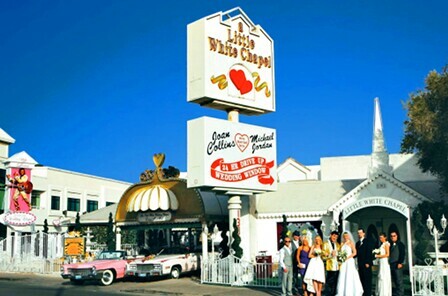 If you want to celebrate in a way as unique as your love, consider our wedding chapel in Las Vegas. Many stars have chosen us for their nuptials, as well as generations of the same family from grandparents to the present generation. Our historic chapel has fostered romance since 1951 and married hundreds of thousands of couples. You might want to get married in Las Vegas within a certain time frame, and create a memorable wedding you can afford. Perhaps you want to start your union in a special way. Or maybe you want to renew your vows and create new memories after years together. Whatever your situation and preferences may be, we offer romantic and affordable options for your day. We also have expert wedding coordinators that will assist you in selecting the ceremony of your choice. Get notifications of our upcoming events and specials right to your inbox. Schedule your ceremony online today.